Giraffe is the family designation of a series of combined G/H-Band pulse Doppler search radars and combat control centres from Ericsson for mobile and static short- or medium-range Command, Control, Communications and Intelligence (C³I) air defence systems. The Giraffe AMB (Agile Multi Beam) is a True Three Dimensional Search Radar - specially designed for operation with Medium and Short Range SAMsystems which features an active phased array antenna with full 3-D capability. It is in development for the Swedish RBS 23 BAMSE air defence missile system. A new integrated C³I system, adapted to air defence systems up to medium range is being developed. Giraffe AMB can be integrated into most air defence systems. 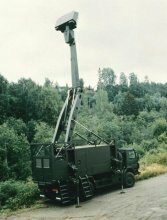 Some 450 Giraffe systems have been ordered since 1978 and the radar is in service in 18 countries outside Sweden. The “stacked beam” antenna concept, employs one wide beam for transmission and multiple narrow beams for simultaneous reception and provides not only an unparalleled 3D target update rate of one per second but also extremely high Altitude coverage. All targets within the elevation envelope are determined using monopulse techniques thus ensuring high quality 3D target data. The antenna sidelobe level is reduced to an absolute minimum giving the Giraffe AMB outstanding jamming resistance.